Minister for Carriacou and Petite Martinique Affairs, Hon. 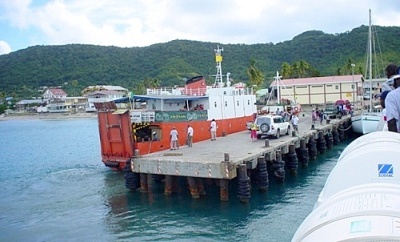 Elvin Nimrod, announced on Tuesday that government has taken the decision to relocate Carriacou’s main port from the town of Hillsborough to the Tyrell Bay Marina in Harvey Vale. Minister Nimrod said the decision was made to safeguard Carriacou residents and visitors from the dangers and inadequacies of the Hillsborough jetty. “Where the jetty is located has been determined to be a danger. It’s a time bomb, an accident waiting to happen — and so government, with its usual sense of obligation, decided it had to take steps necessary and appropriate to make sure that the safety of the people of Grenada, Carriacou and Petite Martinique is assured,” Minister Nimrod said. According to Minister Nimrod, safety and comfort are not the only benefits to be gained; employment, increased tourism and new opportunities are also in store for the people of Carriacou. “With the combination of the marina and the jetty down there, things will be booming commercially and otherwise… a lot of employment would be provided,” he said. “There is no need to feel that Hillsborough will lose any of its potency or any of its activity, because there are specific programmes and projects that will be designed to keep Hillsborough a buzzing town as it is now,” Minister Nimrod said. With discussions between the marina developers and the Grenada Ports Authority completed, the Minister said construction may begin this month.